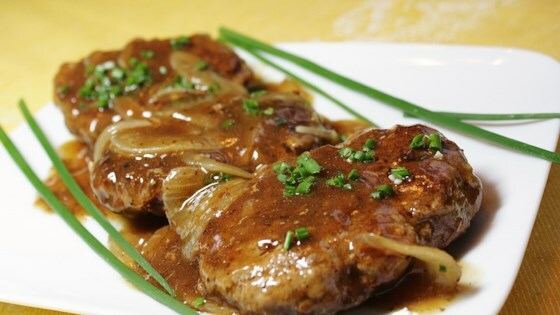 "An easy-to-make classic featuring tasty hamburger 'steaks' smothered in gravy and onions. Traditionally served with hot white rice or potatoes, it's a great way to dress up a pound of ground beef and you probably have all the ingredients on hand!" We loved this recipe, thanks! I used French Onion soup instead of the beef broth, and would highly recommend using ground Angus for the beef. The flavor is wonderful, thanks! This was VERY yummy!!! As always, I made the recipe EXACTLY as it is and I have to say I owuldn't change a thing.